Today we got all the leaders together and discussed about human wildlife conflicts in the Chyulu/Tsavo/Amboseli/Merueshi ecosystem. Leaders included area Chiefs, village elders, area chairman, volunteers and leaders from the game scout unit.The meeting held at Maasai Simba Camp was facilitated by Kakuta Maimai of Maasai Association and chaired by Daniel Sampu from The Big Life Foundation. We discussed about challenges, failures, successes, and positive initiatives to successfully tackle human wildlife conflict in Merrueshi area. 1. Eseriani Wildlife Association was officially accepted in Merueshi area. Eseriani Wildlife Association will provide the game scouts with cameras needed to document predator activities in the area The association will contact Kenya Wildlife Service and request resources for capacity building and community out reach missions. 2. Meruesh community will be fully involved in wildlife conservation in the area. 3. Maasai Association will provide an office where game scouts will dispatch reports to partners for wildlife conservation in Merrueshi area. In addition to Maasai Association staff the scouts will take photos of every incidents by lions using GPS points and disburse the information through email, phone call, and text. 4. The Biglife Foundation will train and employ two game scouts and equip them with GPSs and Cell phones. The organization will continue to provide a rescue vehicle and encounter poaching activities in the area. Next meeting will be held at the Chief’s office in Merrueshi. 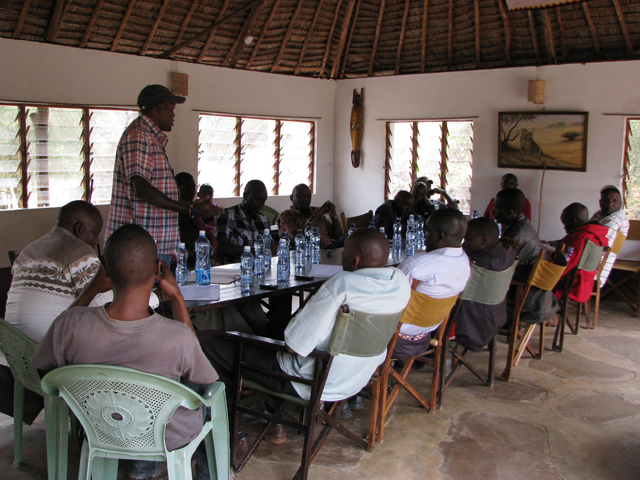 The purpose of the meeting is to bring all the village elders together and show them how they can benefit from wildlife. Stay tuned for update.